For a few, a title is a tangible piece of hardware to obtain at all cost. To some, it comes easy. To others, it may never come - though not from the lack of effort. But at the end of the day, more people walk away without adding points to their title, then do. What keeps us coming back to the field trial game? Surely, it can’t be winning. "A day spent training - or field trialing, or hunting - is always better then any day spent at work." I have spun out more times then I care to remember. I bet everyone can remember their first win, their first point, their first break and their first good trial until the wheels feel off in the third, their first handler error, their first puppy and that unforgetable training session where your dog looked oh, so polished. So then, what is it that keeps us coming back to the game? We dog people are a funny sort. Oh sure, we would sell our soul for a title on our best friend. But I think the title is a excuse to justify our behavior. How else could you explain why we do what we do? For example: the hours spent training, the time at trials, the money for entries, the money for the truck to haul the dogs around, money for the camper and the bird pen. Then, of course, a house on a acreage so you can train. I still can’t wait to get away from work to go dog training. And I'll bet a lot of people spend their long weekends training dogs or on related activities. A day spent training - or field trialing, or hunting - is always better then any day spent at work. I started out looking for a hunting dog. I knew what I wanted... a cocker pup. With a few phone calls, a pup was purchased. Why a cocker, you ask? No particular reason, I just wanted one. I had only trained and trialed labs up to this point and thought I would go outside of the box. Well, when you have the good fortune of having one of the top trainers on the circuit in your back yard and he is not only a nice guy but willing to pass on the knowledge of the game, you must take advantage of the opportunity. I did not have a dog yet, but would show up every opportunity I had to train with him. Many days were spent walking the course and shooting at birds before I even had a dog of my own. Yes, shooting at... not necessarily hitting. But his patience was tremendous and a friendship developed. My dog was enterd in some puppy trials, thus the seed was planted. 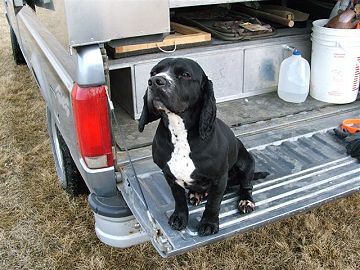 The dog turned out to be a great hunting dog, but not a dog that would be able to compete at the level of performance required of an open dog . A second dog was purchased named Darby’s Mulligan, called "Driver". Yes, he too, was a cocker. The first one turned out not too bad, so I thought, "Why not try anther one?" Driver got a few placements in puppy stakes, so we carried on. He finished his first open without a placement. But he did complete his water retrieve. However, the next day would change my life. 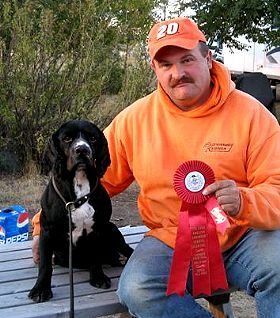 Driver held it together to the end and received the gun dog award. This was more then I could have ever hoped for in such a short period of time. The placements came out and my heart sank when he did not get fourth place. Surely, with all the good experienced dogs running a fourth would be the most one could expect to acquire. Then came out the third placement - and well, for sure it must be over, but for the crying. As they handed out the second, I told myself gunners award is pretty sweet and I should be happy, after all. When they called out my dog for frist place, I swelled up and was shaken to the point of no control. Hugs and high fives and lots of hand shakes were given out. You see, from my trialing days with the labs I know how covetted first place at a trial is. The eight hour drive home was filled with phone calls to all my friends. Boy, the ride back did not take long at all, it just seemed to fly by! After having some more luck, he received a third placement at his next trial . This led me to think a title was going to be a snap. After all, he was only eighteen months old. What could go wrong? Humble pie was served with a long dose of dry spell. Driver completed a few trials the next year, but no such luck in the title dept. I was at a trial sitting in a trailer talking to trialers and they felt I was in for a piece of the pie. Not sure how much, but a piece none the less. Could it be, all he needed was three more point?. Fourth place and third place were called out. Still no such luck. Second place was called out and it had Driver's name on it. Well, drinks went flying, tripping as I went. Again hugs hand shakes, and high fives. Yes, he had earned a Canadian field championship! 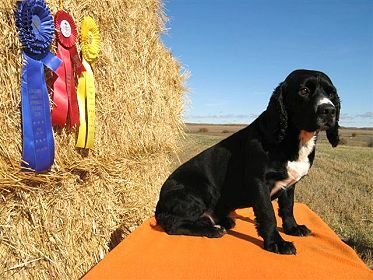 Now, there have been other cockers which have earned this title - even a special cocker that won the Canadian National. These cockers were all dogs that hale from the USA. To the best of my knowledge, he is the frist Canadian born cocker to earn a "CFC". I have met a lot of nice people in the spaniel game and have become friends with them over the years. I can not wait until the spring, so we can go down to North Dakota and run their trial. It helps pass the cold winter having happy trial thoughts. Sure, running trials is fun. But, it is the people that make the circle complete. You see, without the people the title means nothing. The title is a measure of hard work and friendship. We spend countless hours training our dogs, and I bet you, too, had a dog friend there to help you out for a good part of the time. Being able to write "CFC Darby’s Mulligan" on an entry form still chokes me up. But, it is all the people at the trial that keep me coming back.